Here's the first issue of Clarkesworld for 2009 yet it feels like the perfect issue for December, from the snowman cover to "Teaching Bigfoot to Read" to the simply stellar line-up for the month. Not that I'm complaining, mind you, although if you're still in the post-holiday mood, this is definitely one of the issues to check out. 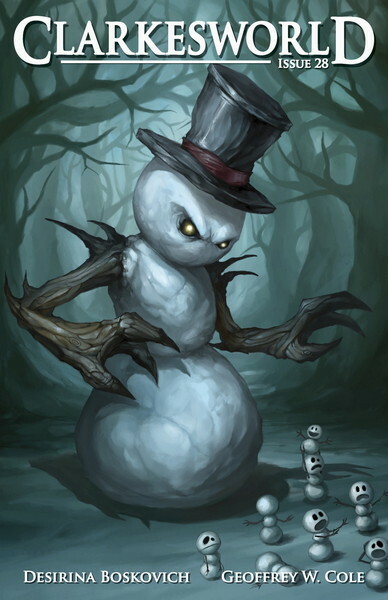 First off is the cover, "Evil Snowman" by Serj Julian. Probably one of the best covers to date and follows what I call the iconic Clarkesworld aesthetic, mixing the familiar with the fantastic, or in this case, something dark and moody. The expressions of the miniature snowmen are great and you'd probably miss it if you were simply looking at the thumbnail of the cover. Again, it would have made a great cover last month but then again, it wasn't snowing yet in early December (and I'm sure there are remnants of snow these days to spook you). 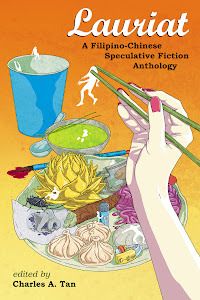 The feature story is "Celadon" by Desirina Boskovich and for the most part, it's a good story. The author focuses on characterization and the strength of this piece is that how it's very personal. It's not about some ideal such as justice but simply a daughter trying to reunite with her mother and the juxtaposition between the two worlds, real or imagined, heighten this agenda. For the most part, it works, and of the two stories in this issue, this is the more ambitious one, at least judging from the language and the technique. Overall however, it lacks the impact I'm looking for but this is nonetheless a good story, one that makes the reader work for the ending. Kate Baker reads "Celadon" and she's competent. A good bulk of the story is narration and she's up to the task as she's fluent and consistent. There's little dialogue and that's perhaps a good thing as Baker doesn't really distinguish between the various characters and I feel her voice is too even. She's expressive though when it comes to the reactions of the characters and one can sense the anxiety of the narrator or the detachment of the anthropologists. "Teaching Bigfoot to Read" by Geoffrey W. Cole uses an interesting technique to narrate his story: emails written to Bigfoot. While that in itself is not a eureka moment, Cole backs it up with a convincing tone of voice with the hard science fiction elements lurking in the backdrop. Much like "Celadon", this story is also a character-driven piece but achieves it through an indirect method. For the most part, it is the reader filling in the gaps rather than what is explicitly mentioned that fuels the reader's imagination. While not as ambitious as Boskovich's story, this is the story that stands out more for me mainly because it succeeds in its execution, not only being easy to read but leaving some room for some ambiguity at the end. Definitely a must-read. Jeremy L. C. Jones's "Anthologists Discuss Their Craft" is a real gem. Jones asks the same set of questions to various editors and they share with us their insights into their personal editing processes. Their answers are unique and clearly elaborated, and the anthologists definitely dominate this nonfiction article. On an unrelated note, all of the male first names start with the letter J. "The Mauna Kea Experience" by David L. Clements is brilliant. Clements has a handle on the elements of storytelling and reading this nonfiction piece is similar to reading a short story. He doesn't simply tell us about his journey, he shares it with us and the bigger impression it leaves isn't what astronomers learned but what they put up with to acquire their findings. Definitely a great start for Clarkesworld and features some solid writing all throughout.